Providing you the best range of gynecology vessel sealer unit, vessel sealing unit with electrosurgical diathermy, shalya vessel sealing systems, touch screen vessel sealer, thermostapler vessel sealing system and shalya vessel sealer diathermy unit with effective & timely delivery. 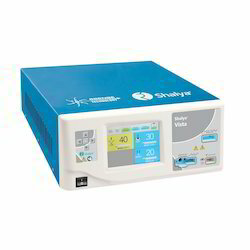 Shalya turoseal series is a high performance electro-surgery unit combined with special vessel sealing feature and saline plasma resection where faster sealing and coagulation takes place with aid of shalya accessories like Vcuter and Rf Scalpel respectively. 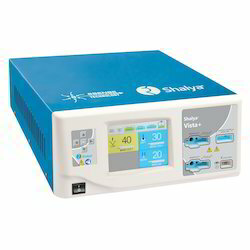 Shalya turoseal series is a high performance 300 Welectro-surgery unit combined with special vessel sealing feature and saline plasma resection.the unit has 4 Cut & Coag modes along with 3 Bipolar & 3 Vessel Modes. Key Feature: Power & Mode can be changed from sterile field using normal Hand-switch. Insert open(OP rEHOLD ) or close ( CL rEHOLD) Alarms given in case of mishandling of tissue. Shalya VesSeal is an ESU generator combined with special vessel sealing feature for efficient sealing and cutting of organs. Faster sealing and coagulation with aid of shalya accessories like Vcuter 10 mm and Rf Scalpel respectively. Insert open(OP rEHOLD ) or close ( CL rEHOLD) Alarms given incase of mishandling of tissue. 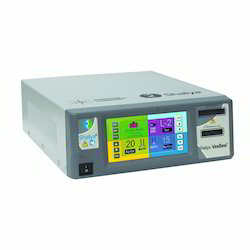 The 5.7’ TFT touch screen electrosurgical unit which allows the surgeon to store 100 surgical programs. The vessel sealing section has 2 sealing modes Swift & Rapid for fast & precise sealing of tissue. and tissues during open and laparoscopic surgery. ThermoStapler system is based on modern bipolar technique. It enables reliable vessel sealing and minimizes the patient’s blood loss during the procedure. This enables faster healing of patient. 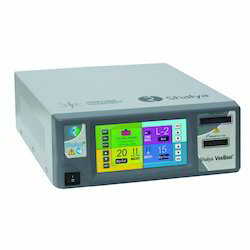 Shalya turoseal series is a micro-processor based electro-surgery unit combined with special vessel sealing feature and saline plasma resection. 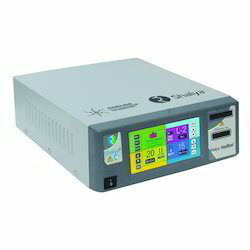 Other upgradable functions include argon beam coagulator, smoke evacuator. · Sealing up to 7mm tissue width can be done, where the sealed tissue is strong enough to withstand 3 times normal systolic pressure. 30 surgical programs can be set by user. The system Provides 2 Vessel Seal Modes: Fine Seal, Rapid Seal & 2 Saline resection mode: Saline Cut & Saline Coag. A thermofusion seal is made by applying calibrated pressure with RF energy. The Collagen & Elastin within the tissue in vessel walls melts & restructure to form a translucent seal.· Faster sealing and coagulation with aid of shalya accessories like Vcuter 10 mm and Rf Scalpel respectively. 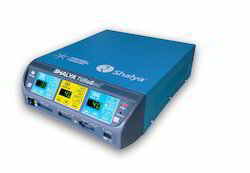 Shalya VesSeal is an ESU generator combined with special vessel sealing feature for efficient sealing and cutting of organ by applying calibrated pressure with High Frequency Current. The Collagen & Elastin within the tissue in vessel walls melts & restructure to form seal. With features like auto stop, bicoag alarm, tissue rehold alarm, vessel sealing alarm etc. which provide safety to patient as well as personnel. • Cystectomy. Resection of ovary & fallopian tube. The esu generator has 7 cut modes with specialized modes like hydro & endo modes along with 7 coag modes like hydro coag & swift. · Insert open(OP rEHOLD ) or close ( CL rEHOLD) Alarms given incase of mishandling of tissue. 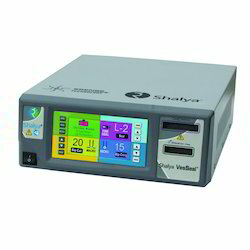 Shalya turoseal series is a high performance electro-surgery unit combined with special vessel sealing feature and saline plasma resection where f aster sealing and coagulation takes place with aid of shalya accessories like Vcuter and Rf Scalpel respectively. Sealing Program: The applied power changes according to tissue types as well as accessory connected saving surgeon’s time and increasing the efficiency of surgery. 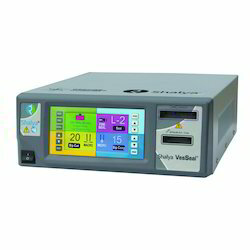 The system sets power according to the accessory connected or tissue grasped. Shalya VesSeal is an ESU generator combined with special vessel sealing feature for efficient sealing and cutting of organ. Insert open(OP rehold) or close ( CL rehold) Alarms given incase of mishandling of tissue.